Jay W. Forrester (1918 - 2016) was a professor at the Massachusetts Institute of Technology (MIT) Sloan School of Management . He is credited with the development the Industrial Dynamics discipline, subsequently evolved to the present System Dynamics. Forrester developed the field through intense interaction with industry, and its theoretical base was strongly influenced by his previous experience with electronic feedback systems. Forrester aimed at giving form to a new kind of management, aware of systemic relationships and evolving organizational behavior, with an imminent need for computer support to properly understand complex management systems. The need for such an approach was derived from generous evidence of recurring erroneous managerial decisions about complex systems due to failed intuition. Prof. Forrester's thought process for the development of his ideas can be laid out in his published work, and the many articles that were written about him through the years. This document attempts to reflect this thought evolution, particularly through notable quotes from each publication. This is a work-in-process. Publications are arranged below in chronological order, and the appropriate references are mentioned at the end. "...flows of information, materials, money, manpower and capital investment [...] interlock to amplify one another to cause change and fluctuation [...] forming a basis for anticipating the effects of decisions, policies, organizational forms, and investment choices..."
"...I am interested in the development of a professional approach to management..."
"...too often management education consists of gathering current industrial practice and presenting it to the student as a series of unrelated subjects [...] and in his [subsequent] work in industry, his learning experience perpetuates the atmosphere of unrelated compartmentalization..."
"...these new management concepts will rest partly in [...] data processing, military research [resulting in] improved understanding of decision making and complex system simulation, [...] and on information feedback systems..."
"...in systems development for the military, it has been amply demonstrated that carefully selected formal rules can lead to tactical decisions that excel those made by human judgement under pressure of time and with insufficient experience or practice..."
"...from the military we have [...] methods of simulation for determining the behavior of complex systems [that] do not require undue mathematical ability..."
"...without an awareness of basic information flow principles, it is only through costly errors that managers can develop an effective intuitive judgement..."
"...Feedback theory explains how decisions, delays, and predictions can produce either good control or dramatically unstable operation..."
"...to begin [...] we need to know three kinds of information about the system: its organizational structure, the delays in decisions and actions, and the governing policies..."
"...the company will come to be recognized not as a collection of separate functions but as a system in which the flows of information, materials, manpower, capital equipment, and money set up forces that determine the basic tendencies toward growth, fluctuation, and decline..."
"...I want to emphasize the idea of [flow] not just [as] the simple three-dimensional relationships of functions [...] but the constant ebb and flow of change in these functions — their relationships as dynamic activities..."
"...the industrial dynamics program at MIT is aimed at four goals: [...] develop better intuition for time varying behavior, [...] show relationships between different aspects of a system,[...] help predict the future course of an organization, [and] improve the future prospects of a company..."
"...the engineer often sees the manager as superficial and lacking intellectual rigor and depth, even though a manager must deal with systems of far greater complexity than those that the engineer designs..."
"...the manager sees the technical man as narrow and lacking interest in people and social systems, even though the engineering is designing [a system] which may help the future manager better understand the complexity of social systems..."
"..the paramount problems in engineering have their origins in the management system [and] a preponderance of [...] managers are not equipped to solve these problems..."
"...management, economics, and much of engineering share [a] common foundation in feedback system behavior and psychology..."
"...having lived [...] in an era of the scientific frontier [it] may be difficult to recognize an era displacement. [...] The next decades may well transition focus [from] attention to science, [...] to understanding the dynamic behavior of our social systems..."
"...we might consider management of the future as 'enterprise engineering', [by] designing a system, principles of feedback control, a clear distinction between policy making and decision making, [and] the substitution of analytic solutions [by] simulation..."
"...social systems are customarily started without a clear statement of underlying philosophy and long-term goals [thus] no framework exists against which to measure shorter-term actions..."
"...companies and countries are usually evolved through trial-and-error [...] attention has been on individual problems [thus] the approach has been piecemeal instead of comprehensive..."
"...[in companies] conditions of the moment are evaluated by essentially static methods, and they govern actions without adequate investigation of the future (dynamic) implications..."
"...feedback control implies not only [...] error correction, but also the entire range of dynamic phenomena that occur within self contained systems..."
"...a system is described by its structure, transfer function,[and] time delays. Noise spectrum, bandwidth, natural frequencies, filter distortion, gain, and transient response must be considered..."
"...policy should be sharply distinguished from decisions. [...] Policies are those rules by which [...] information streams are converted into decisions to control activity. [in contrast] Decisions are continuously generated as a result of applying the Policy to the input data flows..."
"...management [will] distinguish [between] the decision maker and the policy designer [...] the former part of the active operation, [the latter] part of a higher level of abstraction..."
"...even when intuitive thinking attempts to cope with dynamic interactions, it goes little beyond visualizing single loop relationships. However, it is from multi-loop interactions that many difficulties arise..."
"...If the engineer is to succeed in contributing his special qualifications to the management area, he must be able and willing to extend and reinterpret his engineering philosophy and attitudes beyond the limits of pure technology..."
"...[by using industrial dynamics] engineers will bring to actual human organizations the courage to experiment with promising new approaches based on a foundation of design..."
"...feedback systems [...] appear to provide a structure [...] that is equally useful even as one's attention ranges as widely as production, economics, psychology, or growth processes..."
"...a feedback system exists wherever the surrounding circumstances provide the inputs to a decision process which controls an action that is intended to alter the surrounding circumstances..."
"...[for example] the cobweb analysis [in economics] of commodity supply and prices reflects awareness of [...] closed loop interactions..."
"...if awareness of the existence of feedback systems is so widespread, one might ask if the feedback processes are well understood. The answer is negative. Every existing treatment of the subject penetrates a little more than the outer layer of what will become an increasingly important body of knowledge..."
"...feedback systems of greater complexity do not merely bring quantitative extension of behavior modes seen in simpler systems. Entirely new phenomena take place..."
"...our first step [in exploring Industrial Dynamics] was to develop a substructure which would give a skeleton for the main feedback structure of systems..."
"...simulation is the only possible route to handling complex non-linear systems. Mathematical analysis can deal only with the simplest of linear systems and [...] these systems do not exhibit the modes of behavior with which the manager must cope..."
"...the substructure [of Industrial Dynamics] is powerful and simple. It consists of two classes of variables [...] levels and rates..."
"...level variables are accumulations within the system [...] indicate the order of the system [...] and describe the present state of the system..."
"...rates represent activity [...] establish how the levels are changing [and] are the policies or decision-functions that cause the system to evolve..."
"...non-linear behavior is beyond the reach of most mathematical processes. However, [non-linear behavior] is no more difficult to incorporate into simulation studies than are linear relationships..."
"...in our industrial dynamics work we use no mathematics which would be beyond the reach of high school students [...] the difficulty comes in the management concepts [...] as [in industrial dynamics] the emphasis is on interrelating the different aspects [of the system]..."
"...industrial dynamics is [rather] an extension of the case study method than it is a branch of quantitative methods in management..."
"...many of the problems in teaching [...] management arise because the subject is taught in isolation [since] inputs to a functional area come form other parts of the system [and] major consequences of local action may appear elsewhere..."
"...there can be no answer to the question of what information is needed unless one can trace the consequences of the existence or absence of specific information channels [...] only then can one see the consequences of distortion, delay, bias,error, and cross-talk in the information..."
"...the so-called intangibles [such as] psychological variables, integrity, reputation, financial pressure, speculative motivations and fear [...] must be included in our theory of system behavior. [...] There is no reason, except lack of courage on the part of the investigator, for omitting these concepts from our system representation..."
"...complex systems can behave differently under circumstances that superficially appear identical. Managers attribute to outside causes the system-induced crises that come from their own policies..."
"...we have found that graduate school is too late to begin with [the System Dynamics] approach to management..."
"... pointing to the challenges of the future is easy enough; devising really creative ways to meet them is difficult and often controversial..."
"...in technology we expect bold experiments that test ideas [and] obtain new knowledge [...] but in matters of social organisation we usually propose only timid modifications of conventional practice and balk at daring experiment and innovation..."
"...perhaps knowledge is so compartmentalised that no one person sees at the same time the need , the possibility of improvement, and the route of advance [...] perhaps we are reluctant to permit changes to the framework of our own existence..."
"...it is time to apply to business organisations the same willingness to innovate that has set the pace of scientific advance..."
"...four areas [...] offer mutually enhancing basis for a new type of enterprise [...] moving away from authoritarian control, [...] present subordinate-superior basis of control should give way to a more democratic [organisational] form, [...] use of "industrial dynamics" to design the [organisational] policy structure, [and] the use of computers to increase flexibility and efficiency..."
"...the influence of organisational form on human behaviour is central to [...] corporate structure..."
"..authoritarian and bureaucratic control structures mold individual personality [...] environment is seen as capricious, lacking in orderly structure and in cause-and-effect relationships. [...] the individual feels little hope of changing that environment, and is not open to information and observations that would lead to improvement..."
"... four measures of policy are important: [...] Freedom [this is] the extent to which they determine decisions, Accessibility [this is] the extent to which these policies are known to the decision maker, Source [this is] the policy position between two extremes [...] being completely self-determined [or] being completely imposed, and Consistency [this is] their freedom from internal contradiction..."
"...policy should allow for freedom to innovate [and] have the fewest restrictions needed to ensure system strength, stabilty and growth..."
"...policy-making should be separated from the distractions of operational decision-making [or] it will be postponed in response to short-term pressures..."
"...part of the policy design task is to identify the relative importance of the various decision points and to determine the quality and fidelity needed in each information input..."
"...much of the character and atmosphere of an organisation can be deduced from the way it externally extends and withholds information [...] in healthy organisations authority tends to rest on generally recognised superior ability, not excessively bolstered by information monopolies..."
"...information is often withheld forestall questions about an authoritarian decision that has no rational defence..."
"...in primitive societies [...] man adapted to systems without feeling compelled to understand them..."
"... social systems [...] became so complex and their behavior [...] confusing, that no general theory seemed possible [and] a search for orderly structure , for cause and effect relationships, and for a theory to explain system behavior gave way at times to a belief in random, irrational causes..."
"...mere description has not been sufficient to expose the true nature of systems [and] mathematics has not been adequate for handling the essential realities of our [...] social systems..."
"...without an organizing structure, knowledge is a mere collection of observations, practices, and conflicting incidents [...] it is difficult to learn from experience, [and]] it is difficult to use the past to educate for the future..."
"...a systems strucrture should give to education in human affairs the same impetus that the structure of physicallaws has given to technology..."
"[regarding the endogenous point view]...where is the boundary, that encompasses the smallest number of components, within which the dynamic behavior under study is generated?..." "...in concept a feedback system is a closed system. Its dynamic behavior arises within its internal structure. Any action which is essential to the behavior of the mode being investigated must be included inside the system boundary..."
"...a discrepancy between the true system level and the information level that governs decisions always exists in principle..."
"...Industrial dynamics, described as the application of feedback concepts to social systems, is evolving toward a theory of structure in systems as well as being an approach to corporate policy design..."
"...In high-order, nonlinear systems, with multiple loops and both positive and negative feedback, are found the modes of behavior which have been so puzzling in management and economics..."
"[Forrester's study of the state of operations research] indicated that operations research was not dealing effectively with the broader, top-management problems [...] Most of the work was concentrated on individual decisions structured as open-loop processes, meaning that the inputs to the decision process were considered as unaffected by the decisions themselves..."
"...decisions are made for the purpose of influencing the environment and thereby generating different inputs to succeeding decisions..."
"...the mathematical orientation of management science, the concentration on analytical solutions, and the optimization objectives could cope only with rather simple situations. They excluded treatment of the more complex management relationships and also forced neglect of most nonlinear phenomena..."
"...The manager's task is to interrelate the separate functions of the company, to create the flows that cause the company and market mutually to support one another, and to interweave the tangible economic variables with the intangible variables of psychology and power structure..."
"...[from Forrester's study on the state of operations research] the manager's principal problems seemed not to lie in decisions taken as isolated events, but rather in policies that deal with streams of decisions and in the structure of the managerial system that interrelates information sources, policy, and action..."
"...feedback processes emerged as universal in social systems and seemed to hold the key to structuring and clarifying relationships that had remained baffling and contradictory..."
"...with simulation available as a procedure for determining the behavior of a model system, it became fruitful to concentrate not on mathematical methods but on the fundamental nature of structure in systems..."
"...The past and immediate future of industrial dynamics divides into three periods,  1956-1961, Structural Concepts and Steady-Slate Dynamics,  1962-1966, Growth Dynamics and General Systems Theory, [and 3] 1967-1975, Foundations and Bridges..."
because mathematical analytical solutions are impossible, for exposing the nature of system models..."
"...any single-term treatment [of industrial dynamics] is incomplete and somewhat superficial [...] It conveys the importance of structure in determining the behavior of systems. It opens to the student the hope of a better understanding of managerial systems. But it does not prepare the student to proceed by himself..."
"...the book Industrial Dynamics [...] seems readable without any specialized training. However, it can be misleading [as] readers [are not] aware of the extensive background in feedback systems underlying the presentation. [...] The reader without a foundation in feedback dynamics can read the book without realizing that he does not have the conceptual and theoretical background necessary to carry on the work discussed in the book. After reading the book, and apparenly understanding it, such a reader turns to the world around him and finds himself unable, without guidance, to apply successfully the industrial dynamics approach to systems. This difficulty reflects the inadequacy of the present literature and educational materials..."
"...The very widespread but shallow exposure to industrial djmamics has created acceptance beyond the availability of skilled practitioners to deliver on its hope and promise..."
"...The only class of person now having a high probability of success [of applying industrial dynamics] is the one who has studied the dynamics of feedback processes in an engineering curriculum and who then extends and generalizes these ideas in applying them to social systems..."
"...industrial dynamics is a feedback system view of social behavior..."
"...[a] measure [of] the scope of the existing [Feedback theory] literature [...] might examine four dimensions or characteristics of feedback systems - order, direction of feedback, nonlinearity, and loop multiplicity..."
"...In physical systems the order is often defined in terms of the number of energy storage elements. In a system expressed as a differential equation the order is equal to the highest derivative. In a system expressed as a series of integrations the order is equal to the number of integrations. In a system expressed in first-order difference equations (which are integrations), the order is equal to the number of difference equations [...] In more practical terms, the order of the system is equal to the number of accumulations..."
"...positive feedback in the engineering literature is almost entirely omitted because the emphasis has been on steady-state control for maintaining equilibrium conditions..."
"...a system is nonlinear if it contains a multiplication or division of variables or if it has a coefficient which is a function of a variable..."
"...throughout our social systems, nonlinearity dominates behavior..."
"...to represent adequately managerial systems one must incorporate from two to twenty major loops, each of which may contain many minor loops..."
"...As one moves toward systems of greater complexity in any one of the [...] dimensions—order, inclusion of positive feedback, nonlinearity, and multiple loops—he finds that system behavior changes in major qualitative ways. The more complex systems do not merely show extensions of behavior seen in the simpler systems..."
"...Nonlinearity can introduce unexpected behavior in a system. 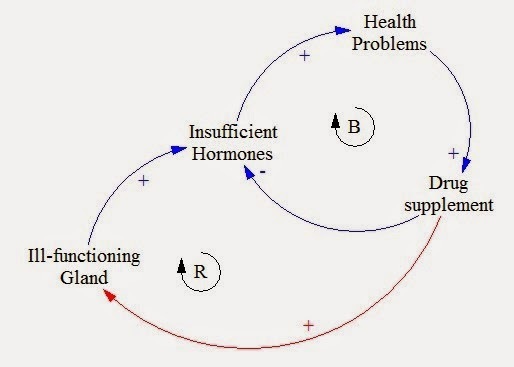 A nonlinear system can be unstable for small disturbances but stable with sustained oscillation for larger disturbances [...] cause a feedback loop to shift its fundamental character between positive feedback and negative feedback [or] can cause dominance to shift from one loop in a system to another..."
"...[in] multiple loop system containing nonlinearities, the system behavior becomes surprisingly insensitive to change in values of a majority of the system parameters. In some system models, 90 % of the parameters can be changed individually by factors of as much as five without substantially affecting the system behavior..."
"...It may be helpful to distinguish two aspects of a system investigation—that relating to structure, and that relating to dynamic behavior [...] The two are intimately interwoven because it is the structure which produces the behavior..."
"...industrial dynamics is a philosophy of structure in systems [...] gradually becoming a body of principles that relate structure to behavior..."
"...Structure is seen as having four significant hierarchies:  The Closed Boundary,  The Feedback Loop as the Basic System Component [constituted by, 2] Levels (the integrations, or accumulations, or states of a system) [and] Rates (the policy statements, or activity variables, or flows") [and 4] Goals, Observed Conditions Discrepancy between Goal and Observed Conditions [and] Desired Action..."
"...A model of a system is formulated by starting with the loop structure, not by starting with components of loops..."
"...The rate variables are the policy statements of the system and within each there is explicitly or impicitly a statement of the goal of that decision-making point in the system, the observed condition, a discrepancy based on the relationship of goal and observed condition, and the desired action that results from the discrepancy..."
"...The feedback loop is fundamentally a closed process in which a decision, acting through time delay and distortion, influences the state of the system which, after further time delay and distortion, is detected as the observed state of the system..."
"...The boundary [in the industrial dynamics model] implies dynamic independence in the sense that any variable crossing the boundary from the outside is not itself a function of the activity within the boundary [...] anything not essential to producing the mode of behavior under study should be left outside the system boundary..."
"...[for] the skilled industrial dynamics analyst [...] establishing the system boundary comes first [followed by] the identification of feedback loops [to then] detai the level and rate substructure..."
"...We believe that the structure [of the industrial dynamic theory] will come to be recognized as having simple elegance, universality, and a fundamental character common to a very broad range of systems running from phj'sical devices through medicine and psychology to social and ecological systems..."
"...structure is a tremendous aid to organizing knowledge in a particular situation [and] one organizes knowledge for a purpose..."
"...an industrial dynamics structuring has almost no relationship to the normal corporate organization chart..."
"...Engineering systems are almost universally defined in terms of differential equations. But this seems artificial. It tends to focus attention on the wrong direction of causality. For example, if one is fillng a tank from a garden hose, our perception of reality suggests thinking of the water in the tank as the integral (accumulation) of the stream from the hose. The alternate statement, built around differentiation rather than integration, would define the water fiow rate from the hose in terms of the derivative of water level in the tank. This derivative formulation comes close to implying that the water fiows from the hose because of the change in water level. The differential equation formulation tends to obscure the direction of causality in systems..."
"...nowhere in nature does the process of differentiation take place [...] No instrument measures derivatives [...] devices which nominally measure rates of flow [...] measure average rates over some time span and operate on principles that involve integration [...] When a physical solution to a differential equation in engineering is to be obtained, as on a differential analyzer, the equation is first integrated enough times to eliminate derivatives [...] "Differential analyzer" is a misnomer; the machine is assembled from integrators..."
"...differentiation is seen as a mathematical artificiality which does not have a real life counterpart in the systems being represented..."
"...systems thinking and the ability to deal with dynamic interactions takes much longer to leam than the facts of the functional areas..."
"...some of the longest time delays exist in the psychological,or decision-making, parts of the corporate and political systems. [...] Psychological delays exist because of the uncertainty in the available information..."
"...there is a human tendency to resist change, so the evidence must often be more than abundantly clear before it induces a response...[however] no information is available to anyone that truly comes out of the future..."
"...in the economic system there are sometimes 'bootstrap' structures, when [the system] output depends on its own output. For example: if the beef industry wants to increase production output, it must first increase its breeding herds, and this is achieved by withholding stock from the market that would have been sold for meat. The result is an initial decrease in production output..."
"...the relationship between structure and randomness [states] that period and damping are determined by the structure of the system, and amplitude by the amount of noise..."
"...underlying minor randomness of everyday decision making are sufficient to feed in the signals that will keep an oscillatory system in a continuous state of motion [...] motion that will have a qualitative character determined much more by the structure and policies of the system, than by the nature of the noise..."
"...real life systems [...] smooth and filter noise to produce cyclic patterns. Any dynamic structure can be viewed as a filter..."
"...Entrainment is the process whereby a small amount of coupling in a system tends to draw together two or more cyclic modes that are of about the same period of oscillation [...] for example, it is reported that several pendulum clocks in the same room can begin to swing in unison because of the slight coupling through the structure of the room..."
"..In designing engineering systems [...] there would be extensive studies [...] Observe how differently social systems are designed. We change laws, organizational forms, policies, and personnel practices on the basis of impressions and committee meetings, usually without any dynamic analysis adequate to prevent unexpected consequences..."
"...there is an unwillingness to accept the idea that families, corporations, and governments belong to the same general class of dynamic structures as do chemical refineries and autopilots for aircraft..."
"...a new kind of management education [...] that we might call 'enterprise design' [and] the output of such an education is the role of 'enterprise designer'"
"...organizations built by committee, by intuition, and by historical happenstance often work no better than would an airplane built by the same methods..."
"... just as successful aircraft is possible only through skilled designers, so in future will competition create the necessity for enterprise designers who can reduce the number of design mistakes in the structures and policies of corporations..."
"...success will follow when the designs of corporations give greater emphasis to removing the causes of problems rather than trying to counteract the symptoms..."
"...management is the process of converting information into action [...] a manager sets the stage for action by choosing which information sources to take seriously and which to ignore...""
"...policy is a rule that states how day-to-day operating decisions are made [...] decisions are actions taken at any particular time and result fromapplying policy rules to [the] particular conditions that prevail at the moment..."
"...civilization is founded not only on the presumption that a basis exists for the guidance of human action, but also on the conviction that we know a great deal about the specific nature and extent of guiding policies..."
"... although 'feedback' has become a word in the public vocabulary, there is little appreciation of its full significance..."
"...Understanding of the dynamics of complicated information-feedback systems is so inadequate that that intuitive judgement should not be trusted to reveal even whether improvement or degradation will result from a given direction of policy change..."
"...[System Dynamics] uses to best advantage the extensive body of operating experience in people's heads wherein lies most of the available information about system structure and policies..."
"...[System Dynamics] realizes that a formal quantitative statement of policy carries no implication regarding absolute accuracy. We can make a formal quantitative statement corresponding to any statement that can be made in descriptive English. Lack of accuracy does not prevent quantifying ideas about policies. Assigning a number does not alter the accuracy of the original statement, but it does create a much more explicit basis for communication. The common belief that one cannot quantify decision rules because of lack of accuracy is confusing accuracy and precision. One can precisely make an inaccurate statement. We can quantify regardless of accuracy. After achieving precision of statement and communication, one can then deal with the question of what is sufficient accuracy..."
"...to omit a decision point is to deny its presence - a mistake of far greater magnitude than any errors in our estimate of the [decision] process..."
"...[System dynamics] must be alert to represent properly the 'worst-before-better' sequences that often arise. The short-term and long-term influences of a decision by a particular input, are often in opposite directions.."
"...System dynamics is a practical profession that starts from important problems, comes to understanding structures that produce undesirable symptoms, and moves on to finding changes in structure and policies that will make a system better behaved..."
"...often a person claims to understand system dynamics after using a particular modeling software. This is like saying that one is a qualified surgeon because of having used a knife [...] well developed and widely available tools often usurp center stage and divert attention away from the philosophy, insights, information sources, understanding of dynamics, and ability to conceive relevant model structures that together for the profession of System Dynamics..."
"...The environments in which we live and operate - corporations, cities, even national economies - are far too complex in their structures and internal processes for any one individual to have a clear, coherent view of how they "work" as total systems - that is, of how particular actions can trigger a cascading series of ever-more indirect effects [...] At most, what we see and understand - often poorly, at that - are the workings of a tiny fraction of such systems. As a result, we regularly make decisions with little or no appreciation of their full range of consequences. And we also make decisions that, by virtue of their consequences, are not really ours to make..."
"...lacking a systemic vision of causality, we have no way of knowing why policies - whether corporate or governmental [...] often produce results directly opposite to those intended. But we do know that this happens - all the time..."
"...only by changing mental models will one change decisions..."
and to whom, establishing policies that govern decisions, and deciding which decisions should be made where..."
when the fault lies in the situation into which they have been put [while] much of the time, it is the design of the organization that is defective..."
"...corporate design often allows, or even specifies, that decisions be made at the wrong places..."
"...for example, production managers should not decide production rates and sales managers should not set prices, because these decisions affect the corporate system far outside their own departments..."
"...management information systems tend to make more and more information available in more and more detail to more and more people until everyone is overwhelmed by excessive information focusing [the] scarce managerial attention on information streams that are not appropriate to the decisions being made..."
"...people usually react too quickly and do too much. They forget that often the right advice is, "Don't just do something, stand there." [...] Only a dynamic systems analysis can accurately show the consequences of a proposed policy..."
"...system dynamics can't help people who have no problems. Such people have no motivation for changing the way their organization operates..."
"...[for system dynamics to help] people must believe that their problems are largely caused by themselves [and] they can change what is causing their problems, rather than blame their problems on others. [then they] become interested in the nature of systems..."
"...[for system dynamics to help] there must be a desire to understand what is happening and why, instead of a grasping for superficial quick fixes..."
"...in general, a good time for CEOs to play the corporate designer role is when  their companies are very successful. But when a company is successful, people are less likely to become uneasy about the future  ...when a founder-manager who has built a successful company realizes he is not sure why the company is successful, and is doubtful about others carrying on after his retirement [and 3] when a new company is being organized..."
"...A system dynamics model usually shows how management is creating the problems that a company is experiencing. Very often the policies adopted to solve a problem are actually causing it. Then, as matters get worse, pressures increase to apply the policies more strongly still..."
which information, which decisions are made at each point in the system, how they are made, and what has happened in the past..."
"...A CEO without system dynamics skills should create a model along with someone who understands both the modelling process and the kinds of feedback structures that can create the problems, [as] the average manager or someone out of an ordinary business school or consulting firm will simply not know which dynamic structures to look for in conversations with operating managers..."
porate participants and be done by them.."
"...There is no guaranteed way to develop a worthwhile [system dynamics] model [...] How do you know how to design a successful airplane? [...] Success in system dynamics comes from understanding some deep fundamentals about the structure and behavioral dynamics of feedback systems..."
"...almost all existing organizations have been created without [a system dynamics model], and most people are unhappy with the results..."
expect managers to do so..."
"...[flight simulator] games tend to focus on decision making; system dynamics focuses on the design of policies that guide decisions..."
structure and behavior that purports to represent something in real life. There can he no proof that it is right. That is not a meaningful question. The relevant question is the degree of confidence one has in a model..."
"...The competition for a system dynamics model is not a comparison against perfection, but a comparison against other models that would he used [as]all decisions are made on th basis of models..."
"...the alternative to a system dynamics model is almost always an inferior mental model that is already in use..."
found [...] that important challenges are no harder to attack than unimportant ones - and the payoff from success is much greater..."
"...people often do not distinguish causes from symptoms or symptoms from solutions..."
"...Modern system dynamics practice [must] keep managers involved at every step of the process [so] when a useful model emerges, managers know how it happened and are more willing to accept the relevance of the results..."
"... even when shared understanding exists [of how undesriable behaviors are generated], established traditions and practices often keep a corrective policy from being adopted..."
"...education for implementation and getting acceptance of the required policies may be a greater challenge than the design [of a system dynamics model]"
"[from a systemdynamcs analysis] the corrective action called for reversing policies that three generations of top management had made public speeches about as the basis for their success. All three generations of former management were alive, in town, on the board, and stockholders. Logic has great difficulty prevailing in that kind of setting..."
"...business leaders make impassioned speeches about the advantages of a free enterprise economic system while running some of the largest socialist bureaucracies in the world. They have central planning, central ownership of capital, central allocation of resources, subjective evaluation of people, lack of internal competition, and decisions made at the top in response to internal political pressures. These are the fundamental characteristics of a socialist economy. The speeches by corporate executives are right; their practices are not..."
"...In all dynamic systems, similar modes of behavior lock together with even very slight coupling between systems. The technical term is 'entrainment'..."
"...System dynamics deals with concepts that have been almost entirely absent in [traditional] education, even though those concepts underlie everything that happens..."
"...the systems viewpoint is a paradigm, a frame of reference, a way of looking at one's surroundings, that takes a long time to internalize [...] Developing such a systems perspective takes less time with a young, inquisitive, and open mind than with one that has already been conditioned to see the world in terms of unidirectional cause and effect..."
"...System dynamics should not be taught as a separate subject but as a common thread running through all subjects..."
"...[when teaching system dynamics in schools] it appears that the prior academic ranking of students does not correlate with how well they do in a school organized around system dynamics and learner-directed learning..."
"...Some of the students who have traditionally ranked at the top are there because they can repeat information from lectures and books. But they may not truly understand its significance and so may do less well in dealing with dynamic relationships. On the other hand, some of the students who ranked at the bottom in conventional terms because they see school as irrelevant, may have keen insight into how the world around them is working, and are inspired by the way system dynamics allows them to build on the mental models they have already acquired..."
"...system dynamics is spreading as people appreciate its unique ability to represent the real world. It can accept the complexity, nonlinearity, and feedback loop structures that are inherent in social and physical systems..."
"...[difficulties] in moving from problem to solution [include] little guidance [...] for converting a real-life situation into a simulation model, [and] many system dynamics projects have fallen short of their potential because of failure to gain the understanding and support necessary for implementation..."
"...in the system dynamics process [...] understanding comes first, but the goal is improvement..."
"...unlike methodologies that focus only on an ideal future condition for a system, system dynamics should reveal the way we arrived at the present and then, in a later step, the path that leads to improvement..."
"...[model] adequacy does not mean proof of validity. There is no way to prove validity of a theory that purports to represent behavior in the real world. One can achieve only a degree of confidence in a model that is a compromise between adequacy and the time and cost of further improvement..."
"...the proper basis of comparison lies between the simulation model and the model that would otherwise be used. That competitive model is almost always the mental model in the heads of the people operating in the real system..."
"...I expect that system dynamics will continue to rest on experience, art, and skill for imagining the most creative and powerful alternatives..."
"...[model] implementation often involves reversing deeply embedded policies and strongly held emotional beliefs. It is not that people disagree with the goals, but rather how to achieve them [...] Even with widespread intellectual agreement with a system dynamics model and with the recommended improved policies, there may still be great discomfort with the prospect of changing from traditional actions..."
"...to overcome both active and passive resistance [to models] requires sufficient duration and intensity of education and debate to reverse traditional practices..."
"...The conceptualization phase of system dynamics has much in common with the soft methodologies, but system dynamics is disciplined by an organizing framework that leads to model formulation and simulation..."
"...Most misbehavior of corporate, social, and governmental systems arises from [a] dependence on erroneous intuitive solutions to complex behavior..."
"...Soft OR has evolved [...] as a reaction against the inability of classical or “hard” operations research to deal with the major issues of interest to managers and political leaders..."
fession [as] hard OR drifted toward continued refinement of the very theories that kept it from engaging the real world..."
challenges rather than engaging the major concerns of the larger society..."
"...Systems thinking is coming to mean little more than thinking about systems, talking about systems, and acknowledging that systems are important. In other words, systems thinking implies a rather general and superficial awareness of systems..."
"...Causal loops do not provide the discipline to thinking imposed by level and rate diagrams in system dynamics. Lacking the identification of level variables, causal loops fail to identify the system elements that produce dynamic behavior..."
"...inventing a theory (model) comes most easily to the prepared mind that is operating within a relevant framework [...] a relevant structural framework disciplines thinking." "...in system dynamics, a causally closed system is one in which the causes creating the behavior of interest lie within the system..."
"...Urban Dynamics was the first of my modeling work to produce strong emotional reactions. It suggested that all of the major urban policies being pursued by the United States lay somewhere between neutral and highly detrimental in their impact [...] More, it argued that the most damaging policy of all was to build low-cost housing..."
"...low-cost housing was a double-edged sword for making urban conditions worse. Such housing used up space where jobs could have been created, while drawing in people who needed jobs [...] Building low-cost housing was a powerful process for producing poverty, not alleviating it..."
"...we have not yet cracked the challenge of how to bring enough people across the barrier separating their usual simple, static view-point from a more comprehensive understanding of dynamic complexity..."
"...World Dynamics seemed to have everything necessary to guarantee no public notice: 40 pages of equations in the middle ofthe book; key messages in the form of computer output graphs; and a publisher that had only published one book before. I thought I was writing for maybe 200 people who would like to try an interesting model on their computers. But I was wrong..."
"...One often sees assertions in the social science literature that the act of studying an organization will alert people to questions about their actions, and that the process of being studied will cause changes in behavior. I do not believe this is true. It is much harder to change decision-making procedures [as] old mental models and decision habits are deeply ingrained; they do not change just because of a logical argument..."
be sufficiently involved in the modeling process to internalize lessons about dynamic feedback behavior [and] start at an early age, before contrary patterns of thought have been irrevocably established..."
"...A case study, like a system dynamics analysis, starts by gathering and organizing information from an actual managerial setting. But the case study leaves this information in a descriptive form that cannot reliably cope with the dynamic complexity that is involved..."
"...System dynamics [...] can organize the descriptive information, retain the richness of the real processes, build on the experiential knowledge of managers, and reveal the dynamic behaviors that follow from different policy choices..."
"...corporate involvement with system dynamics goes much further than we can readily observe, because the best work is surrounded by a high degree of confidentiality..."
"...System dynamics deals with how things change through time. Almost all human concerns relate to how the past led to the present, and how today's actions determine the future..."
"...[in System Dynamics] non-linear models are easier to formulate and easier to interpret, if 'easy' is defined as relating them to the real world. If 'easy'is defined as relating them to some kind of mathematical theory, that is completely another matter..."
"...I would see System Dynamics as what would be called a meta-discipline, a discipline that over-arches over other disciplines, or perhaps more properly, as a discipline which is the foundation under other disciplines. It is a discipline that deals with change, it deals with dynamics, and is applicable in most other disciplines..."
"...Phelps Brown wrote, 'the patience of those who have taken the time to ask businessmen they actually do, as been smiled at as impressionistic, as somehow unprofessional. In the present state of our science at least, I believe this valuation should be inverted. We ought to value the power of observation more highly, than thee powers of abstraction...' . Well. I think system dynamics gives us both: we start with observation and we end with abstraction in the form of models..."
"...In the models, what you discover [and] the insights that you get depend on what you look for; and in larger models you cannot look at every combination of all the things, so there is a matter of both art, practice, experience, and luck..."
"...economics has failed to explain what happens in the real world..."
"...as a result of trying to pose as a science, the field of economics has become substantially detached from real-world behavior, and has tended toward a closed theoretical discipline disconnected from the world it tries to explain..."
making, and nonlinear feedback dynamics [...] to understand and redesign economic systems..."
then test and improve those theories in simulation models..."
"...One often sees assertions about how fast economic change is occurring and how one could not create a model with constant policies that would be valid over 200 years. However, if one models from a sufficiently fundamental level, I believe that there is a structure that is almost unchanging..."
"...Most of the highly visible [economic] changes are superficial..."
more staff it will take a year. With a team of ten, it will never be finished'... "
"...in a nonlinear model, the superposition theorem does not apply; the different modes do not exist separately, and do not simply superimpose on one another..."
"...there is no reason that a generic model should reproduce any specific historical time series. Instead, it should generate the kind of dynamic behavior that is observed in the systems that are being represented..."
very important, but the specific values at exact points in historical time are not..."
respond to economic conditions, take actions, and respond to new economic situations that they may or may not have influenced..."
tem dynamics model that we are discussing, the microstructure creates the macrobehavior..."
common class of systems to which the special case belongs [...] Generic structures give a student powerful insights that are transferable from one setting to another..."
"...A generic model is a theory of how the class of member systems behaves. The theory arises from observation of the real system and from information that is almost always sufficiently available..."
"...To use only numerical data and to exclude information from the mental and written data bases means that one loses most of the available information about structure and governing policies..."
"...I believe that attempts to forecast future conditions is a losing game and has been a diversion that has carried economists away from far more productive work..."
"...the relationship, between the short time within which to make a reliable forecast and the long time required to affect the system, limits the usefulness of forecasting [...] As a result, and with only a little exaggeration, we can conclude that one can forecast in the time zone in which one cannot act, and can act in the time zone in which one cannot forecast..."
"...a system dynamics model should be used to forecast how the nature of the behavior of a system would be altered by consistently following an alternative policy..."
"...In mainstream academic economics there is little acknowledgment that the major depressions could be a dynamic mode that is separate from business cycles [this rejection] probably results from there being no systemic theory that could explain depression episodes that are decades apart..."
"...Most economists deny the existence of a systemic cause for depressions..."
"...A model is a theory that explains the behavior created by the model..."
"...Confidence in such a model depends on whether or not the structure of the model can be identified in the real world, how similar the model behavior is to the kind of behavior that has been observed, and how well changes in model policies result in changes in behavior that are reasonable and that have been observed in actual economies..."
"...[referring to the Kondratieff cycle] modeling has often revealed behavior that was unexpected, and for which there was no prior reference mode, but which was then found to exist in the real system..."
"...When such unexpected behavior occurs in a model, one should start by looking for errors in the model. However, as a model is improved, there is a rising chance that unexpected behavior is revealing something about the real system..."
"...the older the person is, the more the tendency to inquire has been driven out..."
"...it is much easier to bring system dynamics in at the grade-school level than it is at the graduate school , because there is much less to unlearn..."
"...people discover that their own policies inevitably generate their troubles [...] that is a very treacherous situation because if ylu believe that these policies solve the problem, and you do not see that they are causing the problem, you keep repeating more of the very policies that create the problem in the first place. This can produce a downward spiral towards failure..."
" [the Limits to Growth study] had everything necessary to guarantee no public notice, including 40 pages of equations..."
"...differential equations are difficult, confusing, weak and unrealistic [...] they often mislead students as to the nature of the systems [...] derivatives do not exist except in a mathematicians's imagination. Nowhere in nature does nature take a derivative [...] nature only integrates, that is, it accumulates in stocks [levels]..."
"...There is an assumption that expensive sponsorship must precede an effort to address important issues. However, if the objective is sufficiently clear, a rather powerful small model can be created, and the insights sharply focused. Often, the consequences of such a book will be so dramatic and controversial that few financial sponsors are willing to be drawn into the fray. However, the task can lie within the resources of an individual. Where are the people who can carry system dynamics to the public?..." "...Why is there so little impact of system dynamics in the most important social questions? [...] the failure [...] lies directly with the system dynamics profession and not with those in government [...] Those in system dynamics are asking the wrong questions about the sources of low influence..."
"...One hears repeatedly the question of how we in system dynamics might reach “decision makers”. With respect to the important questions, there are no decision makers. Those at the top of a hierarchy only appear to have influence..."
"...big issues cannot be dealt with in the realm of small decisions..."
policies that are causing the trouble..."
"...before one can hope to influence government, one must build the public constituency to support policy reversals..."
"...We see many people trying to “dumb down” system dynamics into “systems thinking” and “causal loop diagrams”, which lack the power that is inherent in system dynamics. This may be because too many in the field lack the deep system dynamics competence necessary to convey and demonstrate the undiluted power of the field..."
"...Making system dynamics simple is a losing game. System dynamics is not simple. The problems of complex feedback systems are not simple. Reversing popular but harmful policies necessary to improve society is not simple. The simplified dilution of the field will fail and will discredit system dynamics so that even excellent work is suspect..."
"...those who take the road of systems thinking and causal loop diagrams are not practicing system dynamics. They remain dependent on the human mind for solving the dynamic behaviors..."
kind of continuing effect that an enduring policy change might cause in the behavior of the system..."
"...exactly matching a historical time series is a weak indicator of model usefulness..."
1. Start with a clear description of the system shortcoming to be improved. 2. Display a compact model that shows how the difficulty is being caused. 3. Base description on a model that is completely endogenous with no external time series to drive it. 4. Argue for the model being generic and descriptive of other members of a class of systems to which the system at hand belongs. 5. Show how the model behavior fits other members of the class as policies followed by those other members are tested. 6. Arrive at recommended policies that the author is willing to defend. 7. Discusse how the recommended policies differ from past practice. " "one can forecast future conditions in the region where action is not effective, and one can have influence in the region where forecasting is not reliable..."
"..We should not be advising people on the decision they should now make, but rather on how to change policies that will guide future decisions.."
"...we should not expect system dynamics to be easy to master. Designing an airplane is hard. Designing a bridge is hard. Doing a heart transplant is hard. System dynamics is even harder..."
"...In a corporation, one can devote several years to moving the thinking of top executives to an understanding of dynamic behavior and the need for radical policy change. At about the time they are ready to act, they retire or die, and one must start over with a new group that must be conditioned from the beginning..."
the emperors have no clothes..."
"...absolute continuity of motion is not comprehensible to the human mind. Laws of motion of any kind become comprehensible to man only when he examines arbitrarily selected elements of that motion; but at the same time a large proportion of human error comes from the arbitrary division of continuous motion into discontinuous elements [...] only by taking infinitesimally small units for observation (the differential of history, that is, the individual tendencies of men) and attaining the art of integrating them (that is, finding the sum of these infinitesimals) can we hope to arrive at the laws of history..." - Leo Tolstoy, War and Peace. "...We cannot teac system dynamics without also introducing the student to the feedback loops of which the learning process is part. Therefore a section concerned with the history of systems thought is necessary to lay out the correct cirrcumstances..."
Fisher L 2005. The prophet of unintended consequences, strategy+business 40, Booz & Co.
Forrester, J.W., 1958. Industrial dynamics-a major breakthrough for decision makers. Harvard business review, 36(4), p.37. Forrester, J.W., 1964. Common foundations underlying engineering and management. IEEE spectrum, 1(9), pp.66-77. Forrester, J.W., 1965. A new corporate design. IMR; Industrial Management Review (pre-1986), 7(1), p.5. Forrester, J.W., 1968. Industrial dynamics—after the first decade. Management Science 14(7), pp.398-415. Forrester, J.W., 1969. Principles of systems: text and workbook. Wright-Allen Press. Forrester, J.W., 1977. Growth cycles. De Economist, 125(4), pp.525-543. Forrester, J.W., 1993. System dynamics and the lessons of 35 years. In A systems-based approach to policymaking (pp. 199-240). Springer US. Forrester, J.W., 1992. Policies, decisions and information sources for modeling. European Journal of Operational Research, 59(1), pp.42-63. Forrester, J.W., 1994. System dynamics, systems thinking, and soft OR. System dynamics review, 10(2‐3), pp.245-256. Forrester, J.W., 1995. The beginning of system dynamics. The McKinsey Quarterly, (4), pp.4-5. Forrester, J.W., 2007. System dynamics—the next fifty years. System Dynamics Review, 23(2‐3), pp.359-370. Forrester, J.W., 2009. Some basic concepts in system dynamics. Sloan School of Management, Massachusetts Institute of Technology, Cambridge. Forrester, J.W., 2013. Economic theory for the new millennium (2003). System Dynamics Review, 29(1), pp.26-41. Keough, M. and Doman, A., 1992. The CEO as organization designer. The McKinsey Quarterly, (2), pp.3-31. How did the US control the inflation that had plagued it throughout most of the 1970's? An unlikely hero drove the inflation down in most unexpected ways, by looking at the system. Today I came across this story which completely caught my attention as a beautiful example of systemic thinking. I am an avid Podcast listener during my commuting to and from work, and it continues to be a great source of insights. With System Dynamics permanently in my head, I am increasingly conditioned to hear the systemic effects in the stories that I hear, and I must accept that these episodes of system-realization are increasing. I find myself wondering continuously at all the systems around me I failed to see when I did not think in terms of systems. If you want to listen to the podcast first, you can do this here. Thereafter you can go to the section in this blog where we analyze what happened. If you don't want to listen, read on. The basic facts of the story are the following. 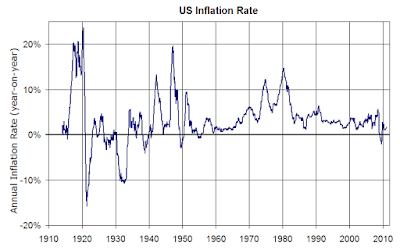 The US was in an inflationary crisis during most of the 1970's. Inflation reached as much as 10% annually, meaning that the quantity people could buy with the money they were earning , was less and less every month. This was partially caused by the uncontrolled printing of money by the Federal reserve. Why does this printing of money have this effect? Well, to quote the example in the podcast, imagine an island where there is 1000 coconuts and 1000 printed bills with which to buy them. Then each coconut would be worth 1 bill. Now imagine a plane flies over the island and drops another 1000 bills. How much would each coconut be worth now? by simple math, if there are still the same 1000 coconuts in the island and now there are 2000 bills in total, then each coconut would now be worth 2 bills instead of one. The "inflation" generated by these additional bills has then resulted in each bill being able to buy less coconut than before. A similar effect was happening in the US at that point in time. This can create a vicious loop where as people can buy less with the money they have, and thus complain to the government, it leads to the government printing more money, which in turn decreases even more the purchasing capacity of the existing money. If not controlled, this can lead (and has led in many cases throughout history) to the collapse of a currency. The President of the US at that time, Gerald Ford, wanted to get hold of the inflation, and appointed Paul Volcker in 1979 as chairman of the US Federal Reserve. He was convinced that it was the uncontrolled printing of money which was causing the problem, so he decided to stop printing money. According to his understanding this would then stop the existing money from loosing more of its value, and thus inflation would be controlled. It all seemed to work fine in theory. Only that when he did this, the inflation not only continued, but rose to higher levels, and stayed at those high levels for almost 2 years before coming down. There was something Volcker had overlooked. What had happened then? Well, when the Federal reserve stopped printing more money, the effect that was sought did not come to be because the people did not believe inflation would go down,even though the government said this officially though the media. What was happening was that people, believing that the price of goods would continue to rise, preferred to buy goods now with the money they had. This led then to an increased demand of goods, which made the goods scarce, and therefore their price continued to rise. If only people had believed the Government that inflation would decrease through the measures they were taking, inflation would have stopped as planned. But it did not. Why? because of what people BELIEVED. Their expectations of inflation, drove that inflation. There are many examples of this, where peoples expectations drive the phenomenon they are looking to avoid and which I will probably cover in another post, but it involves systemic effects in all cases. People's decisions had consequences far beyond the immediate effects, as in this case. It took almost 2 years for inflation to subside. During this time Paul Volcker stayed firm with his decision of not printing more bills, yet had to deal with unemployment not seen since the great depression and general public discontent. Once the inflation went down to low single digits, did the US kick start again,but having passed the trauma of unemployment on a mass scale, with consequences throughout the world. It is important to note that the inflation in the US has since not risen to high levels again, and public opinion polls continue to show that the US population believes the Federal reserve will keep this under control. Seems like the self fulfilling prophecy, for the moment, is towards believing in the Federal reserve, not like in the 1970's. The previous section stated the facts, and it could be similar to a doctor initially analyzing the symptoms of the patient: what were the sequence of events? so you have any rushes, pains, dizziness? However, in the same way, although making a good description of the problem, is not nearly good enough for finding its solution.We need to dig a bit deeper into how this problem comes about, this is, the structure of the system that leads to the unwanted behavior. First, there are several feedback loops involved in this process These feedback loops result in the inevitable boosting of an unwanted behavior, just because of how the people and relationships present in the system. 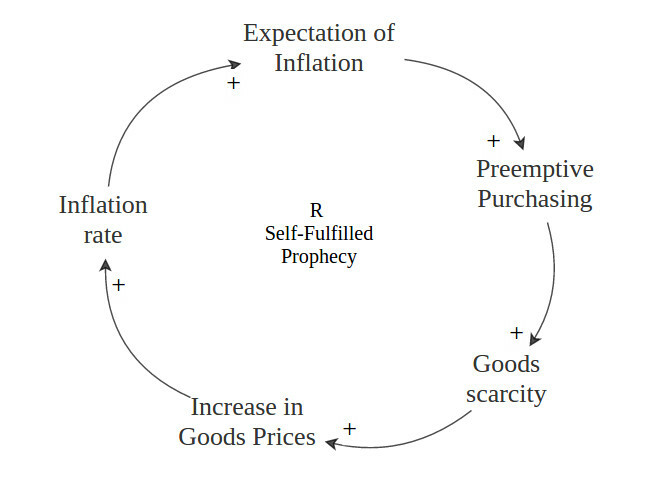 "Expectation of Inflation" and "Preemptive purchasing are related because the story tells us that since the population expected prices to increase, they would buy goods sooner rather than later before the prices would be higher, not necessarily because they needed those goods at that point. These two are POSITIVELY related since, the more that people expected a rise in inflation, the more preemptive purchasing there would be. Look at the relationships within feedback loops here. finally, the more the inflation rate would increase , the more the expectation of inflation increase would be confirmed and strengthened. This means that starting from an existing expectation of inflation, through the effect of hoarding among others, would mean an escalation of prices without bounds. This has happened in history. the old Weimar Republic suffered this in the 1920's, as did many other countries and societies throughout history. An increasing inflation rate, due to complaints by the population according to the US inflation story, led to government printing more money to solve the issue (this is, until Paul Volckner came along). These two variables are then positively related: the higher the inflation rate, the more additional bills are printed. 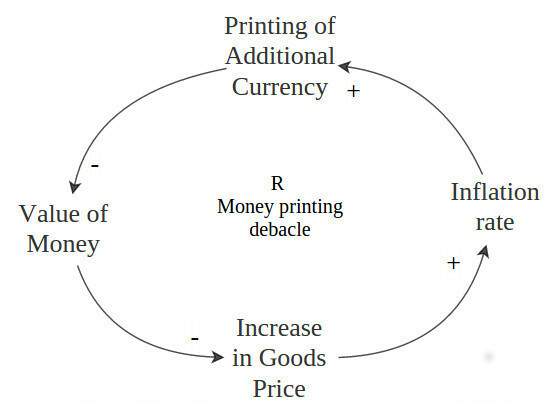 Now according to the simplified coconut story, but just as true in a real, more complex economy, the printing of more bills leads to a decrease in the value of money, meaning that the same physical bill will be able to buy less and less due to the effect of there simply being more bills around. Therefore the "Additional printing" leads to a DECREASE in the value of money. Since these two related variables behave in opposite ways (when one increases the other one increases or vice-versa, these are said to be related in a NEGATIVE way (indicated with a negative sign in the causal loop diagram. Look at the relationships within feedback loops here. The less value money has, the more money it will be required (more physical bills) to purchase the same goods, and thus the prices will increase. These two variables "value of money" and "Increase in Prices" are NEGATIVELY related, when one increases, the other decreases or vice-versa. Finally, when the price levels increase, the inflation rate increases as well. It is important to note that the purchasing power of money (Value of Money) as reflected through the prices in the economy, is something that can adjust very quickly, and so it did in this story. However, the expectation of inflation is something that took a long time to adjust. Expectations are beliefs held throughout a group of people, and these normally take a long time to adjust, depending mainly on how quickly the "contagion for the new expectation" spreads throughout the population. 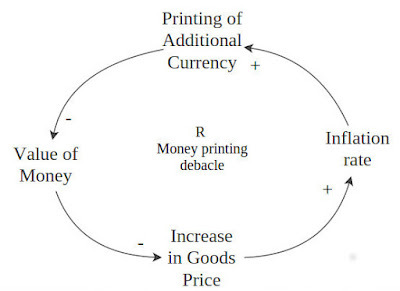 The loop named "Money printing debacle" has a greater speed than the slower "Self-fulfilled prophecy" loop. Several models have been developed to explain how this "contagion" can take place. One that is relatively well known is the Bass Diffusion model, developed for the marketing industry in the 1950's. This model basically proposes that the contagion of ideas within a population can take place in two different ways, either through direct contact between people, or through the influence of advertising. There are many things in our everyday systems that modify slowly, such as the example of the adjustment of expectations. Things that take along time to adjust are said to have a greater systemic inertia, as they are difficult to "move" and thus slow to change. Things that are difficult to "move" and which have been found to have big systemic inertia are, for example, cultural norms, habits and perceptions present in a community, as well as multiple types of expectations present in society and which invisibly, yet surely influence our lives, just as in the case of the "expectation of inflation" mentioned in the story here. When a long and a short term loops coincide and act on the same problem (as it will normally be the case), it is a very normal thing to react first to the short term loops as their effects are apparent more quickly. This would however lead to a short term solution which would be deleterious in the long term, which is the appropriate time-span from which to search solutions to inflation. It is thus remarkable that Volcker remained by his decision, somehow firmly believing in the long-term effects of his measures, no matter how tumultuous their effects where in the short term. eventually the expectation of inflation subsided, as the community slowly but surely realized that these measures were not a passing fancy, but rather where having the effects the Federal Reserve promised. Deducing from this story, a sensible question remains: how much longer will the current self fulfilled prophecy hold in the US, that the Federal Reserve is in control of inflation, until the effect of the trillions of dollars that have been printed without any backing, finally sinks in? Normally, the taking of drugs for health reasons follows the diagnosis of a particular condition which requires this supplement. Ideally this intake is temporary, but in many cases it can become a permanent part of our lives. I came across these cases through a close friend, who was diagnosed with hypothyroidism, a condition through which the Thyroid Gland is unable to produce the quantity of hormones required by the body. In the case of Hypothyroidism, this production is below what would be required by the body. The opposite also occurs, cases when the Thyroid glad produces too much hormones, condition known as Hyperthyroidism. Throughout my life and studies I have increasingly believed that our human body is a very good adaptive machine, and therefore this permanent drug intake recommendation sounded a bit against what I believed the human body evolution could provide. This became even more acute some months ago, when an x-ray of this friend's Thyroid gland showed its severe atrophy to about 25% of its normal size. This nonetheless the fact that she has been taking a supplementary hormone for her condition for the last 20 years. I decided to take a look at this problem with a systemic outlook. These have a positive relationship since the higher the hormone insufficiency, the higher the health problems, all else equal. In the same way, the more ill-functioning of the thyroid gland, the higher expected hormone insufficiency. 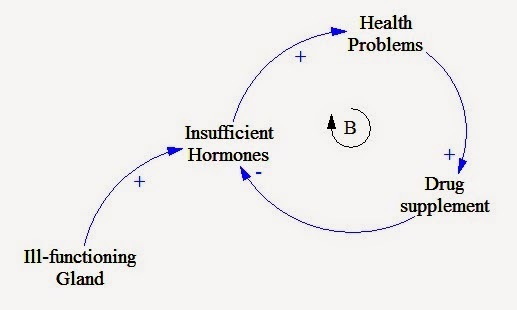 This can be confirmed through the following though experiment, and simply by following the arrows and considering the polarities of the relationships between variables (either positive or negative): The Higher the hormone insufficiency, the more health problems that are experienced, which in turn lead to a Higher drug supplement intake.Finally, the higher Drug supplement intake leads to a reduced hormone deficiency, closing the loop and counteracting our initial condition (Hormone Insufficiency level). What if a side effect of the drug supplement intake in this case is leading to an ever increasing gland malfunctioning? If this were the case, then the process of drug intake would create a reinforcing loop through its effect in the underlying problem, namely ill-functioning gland. 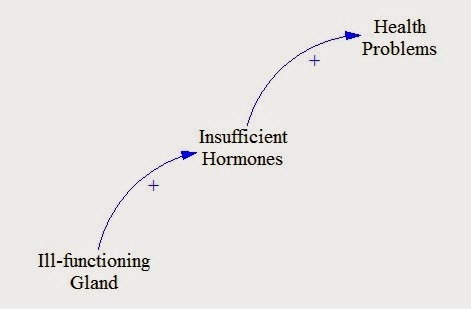 In other words, the presence of increased levels of hormones in the body despite an ill-functioning thyroid gland (increased levels resulting from the drug supplement intake) could be signalling the body that the gland is in fact not required,and the body being an effective system, would then slowly reduce the gland size. This would indeed explain the small Thyroid gland size detected in my friend. In a short period of research, I have not found any documents in regard with the effect of increased hormone levels in the body on an ill-functioning gland. I have however come across several examples of bodily adaptations which denote efficiency in body disposition. How does an increased level of hormones affect the development of an ill-functioning endocrine Gland? Are there any techniques which aim at the recuperation of Gland function? What are the economic incentives that would promote the search for Gland recuperation instead of drug consumption? Nevertheless System Dynamics has allowed me to take a very interesting first look at this problem.